Originally posted on Facebook – Reproduced here by kind permission of Jessica Harding for the benefit of the lucky people who don’t use it! At the beginning Mark Pawsey read out a list of names of MPs who sent their apologies for not attending. (There was a debate on Housing Benefit happening at the same time) Hope we get to see the minutes to see which MPs it was. Dan Marchant (Vape Club) presented the results of a survey (“What does the industry think?”) of vendors undertaken by 100k and Vape Club. Only 40 odd vendors have participated so far – needs far more. Some of the results – vendors think that the estimated cost of of £1.3m for implementing Article 20 is a bad joke (missed the slide with their estimate, sorry). Vendors thought that the average spend for a vaper is £987 per year. They predict a 48% reduction in business once the TPD is enacted – 52% will go to tobacco or the black market. They estimate that 84% of devices are not TPD compliant. I missed their estimate of % loss of flavour types. 62% of bottles sold are larger than 10ml and 17% of current juice sales are for 20mg/ml + They estimate that 55% of vape shops will close. Conclusion was that vapers should pin responsibility on the government + they note that the Dept of Health wanted tougher regs. Lorien’s presentation focused on the effect on people. She did a fantastic job. 2.6m vapers have no idea of what will happen. We long term users are not representative – and we over represent ourselves. The majority of vapers are new and sensitive, still transitioning. Shops will disappear, new vapers will lose that support + they’ve been bombarded with media horror stories. Consequences will be: people will go back to smoking + the other consequence will be the growth of the black market + more accidents (home mixing). New vapers need higher strength eliquids – many of them use the lower generation devices which need higher nic strengths to be effective. 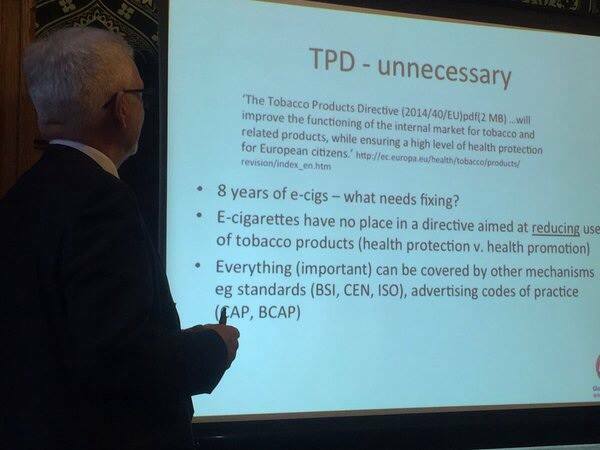 Govt and MHRA are doing a good job of trying to mitigate the TPD. Only recommendation she can think of (it’s so dire) is for public health bodies etc to work together to encourage and support new vapers. 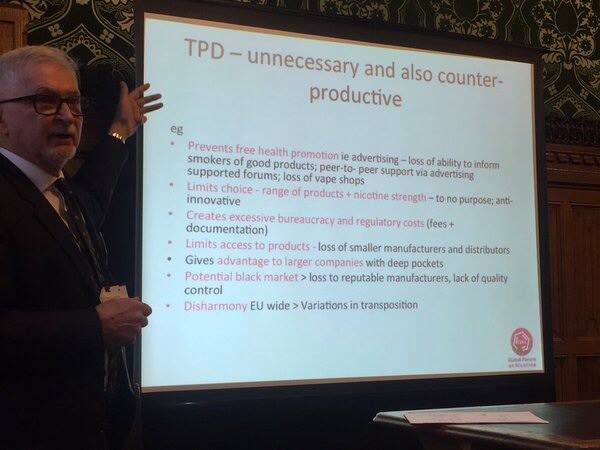 Gerry Stimson’s presentation: All intervention, including the TPD, should be judged against its contribution to ending smoking. Since 2007 a consumer led initiative has driven down smoking prevalence. The naysayers are people who should know better. Smoking cessation has become enjoyable. Vapeshops, forums etc have become the frontline in smoking cessation, at no cost to the tax payer. Does Art20 help or hinder? In 8 years of ecigs what actually needs fixing? (very little) TPD is unnecessary and counterproductive. Also there’s disharmony with the transposition (member states different implementations) which is against EU principles. Gerry called for a rapid review of the TPD, ahead of the standard 5 years, and for more Parliamentary scrutiny. And-Cameron and Corbyn actually agree on the subject of e-cigs being a good thing! Gerry also talked later about e-cigs on prescription. I didn’t note the arguments for and against as they are very well documented. Mark Pawsey (MP for Rugby who leads the APPG on e-cigs). We should push for an early review and evidence of the negative effects (return to smoking and black market) needs to be gathered. 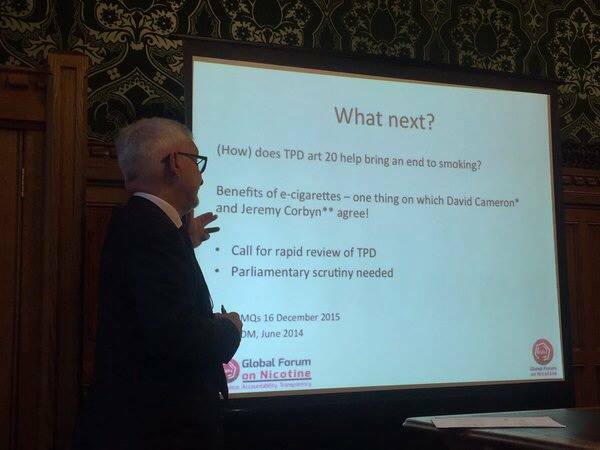 Vapers should engage with their MPs to make them aware of the APPG and ask them to come to the meetings. The APPG can write to Select committee for Health (to push for an early review and offer evidence) but it would be much more effective if constituents asked their MPs to request it directly. The select committee should be asked to add it to their timetable. He said that their timetable is very full so it could be a year before they discuss it. He said too that the 100K survey needs more participants. Also, the TPD is legislation, nothing will stop it from coming into force in May. In his opinion there is zero chance of getting it included in the negotiations which Cameron is having with the EU. The regulations are already in place so it isn’t a good campaigning issue. (the Directive is in place) The most likely scenario is that the government will look at it once it has been enacted. There were lots of questions and comments – which I haven’t managed to fully note. Lots of vendors there, many looking grim faced. 2 people voiced concern about the TPD 2ml tank limit only applying to filled tanks and the MHRA stating that it applies to all tanks – is the government gold plating? One vendor said the 20mg/ml limit was fine because people could just vape more – that didn’t go down too well. There was one person there from from public health, East Sussex health authority (? ), who called for vendors to work with stop smoking services. Matt Ridley was there. He said it’s worth influencing the Lords – mass letters to them do get noticed. Also, we need to get it in the public’s mind that accidents as a result of the TPD are the fault of the legislation and not the fault of ecigs. And-we need to get “vaping” used more – it isn’t yet a widely recognised term.